Regular brain storming sessions are held regarding the content and method of teaching, as, a part of our aim is to provide innovative learning experience. Extensive care is taken to impart knowledge learning in a manner best suited for the child’s developmental stage. Our aim is that they touch, see, taste, hear and smell and thereby striking an interesting balance between learning and playing. We believe, each child is unique and is a bundle of talents. It is through play that children at a very early age engage and interact with the world around them. However, kids today do not have space or the time to engage in free play. What then, can parents of little children do? Yo Poppins Play areas come as a great boon for parents and children alike. They offer a safe place for children to play to their heart’s content! Despite the long day at school, your child is not going to be satisfied if that is all she has to stimulate her throughout the day. Here is where extracurricular activities come into play. After a snack and some rest, your child will benefit greatly from a non-academic activity that they have an interest in. They can choose something like sports, chess clubs, dance clubs, book clubs, and music clubs and so on… your child is bound to find something she likes! Academic activities are often not aimed at all-round development, and this is why every child needs to be involved in one extracurricular activity. They often also learn other important life skills such as teamwork, problem-solving skills and other things they will need to grow up into well-balanced adults in life. 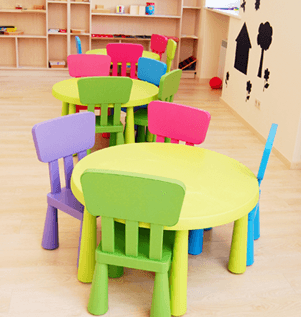 Schools have made attempts to make such environments for children, and so there are different options for your child to choose from such as school bands, dance teams, sports teams and they can even join the school paper. It is most often during extracurricular activities that children find others their ages that have common interests and lifelong friendships are forged. Everybody needs friends. You can feel very sad and lonely if you don’t have someone to play with and be with – it happens to everybody sometimes. Here are some ideas to help you in making friends and keeping friends. Having friends is also about how to be a friend and how to be a friend to yourself! · Sharing ideas and treats. · Respecting each other’s differences. · Loyalty, sticking up for each other. · Caring for each other’s safety and wellbeing. · Both of you working on the skills to keep your friendship going. Executive function skills: the ability to hold and manipulate information in the brain, plan and regulate one’s behaviour, problem-solve, and be creative. Emotional self-regulation skills: the ability to adapt behaviours depending on the situation, to control impulses and to shift attention. Self-regulation in learning skills: the ability to postpone immediate satisfaction to attain long-term goals, sustain attention, be persistent, and remain concentrated. Preschool programs are particularly successful in giving children from vulnerable families a boost, putting them on even footing with more affluent families as they prepare to start school. I am writing this review after sending my daughter from last 7 months. My experience has been great always…most important thing that Sangeeta & Ankur always open to listen to even smallest issues which parents have & resolve it with utmost responsibility. I was also very scared while searching a good daycare for my 8 month old daughter & after doing lots of research i zeroed upon Yo Poppins & i always have been a nagging parent to them (as like all mothers 😀 ) but she always heard it patiently & tried to resolve it Earliest. Teachers like Jaya & Poonam are really well while handling toddlers. A wonderful & lively place for kids. Yo Poppins has proved to be the Best place for my child. Teachers and staff are qualified, nice and cooperative. I like the way , teachers put up innovative methods for making kids learn and understand many things. My child has learnt enormous things from yo Poppins. And on the top of it, you may feel that warm and healthy response from Sangeeta mam and Ankur sir who are whole-heartedly running this daycare. The most important part is my child loves that place and doesn’t want to be back home. We have to forcefully take her home. It has proved a second home for my child. And I am glad , I ended up searching a perfect place for my child. Thanks Yo Poppins for providing such good environment for my baby. And I wish you will keep on providing your best of best services. Wish you good luck and best wishes. Me and My husband were very tensed when I had to join office last year. That time Dhruv was just 5 month old and we were not satisfied with the kind of facility in our society that time .. I got to know about Yo poppins Day care through my friend and we visited then personally and then decided after few trials that this is right place where we can placed our child. They have recently opened and has lot of passion and zeal to take care of little stars in a professional manner and maintaining quality in terms of food, safety and staff. They need to know focus more towards learning aspects by placing more n more qualified staff so that from the beginning baby grasp correct words and learning and its good that they are working in that direction also for nurturing the child in correct way. Hope they will grow more and keep adding new innovative technology in sharpening child persona and to beat competitive market. Thanks all love , support and cooperation from Ankur Sir and Sangeeta Ma’am . Wish you all the very best…..
Yo Poppins Noida brings to you an ideal solution by providing your kids a cosy nest away from home. At this age, children are driven to learn and actively come to terms with the way the world operates. In our centers, children also develop literary skills at an early age primary education.